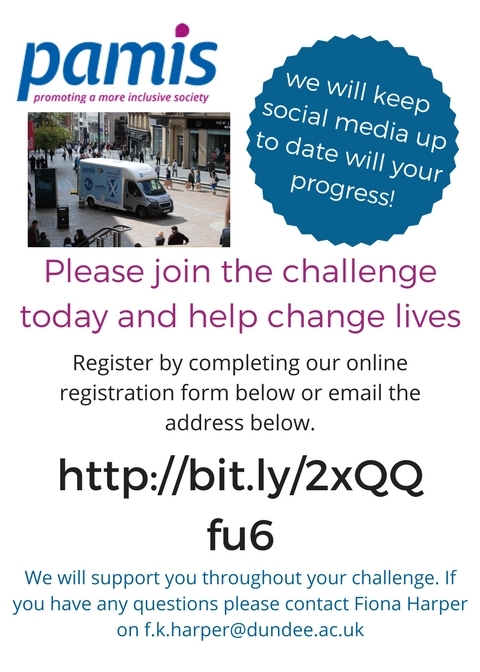 Inspired by our 25th anniversary this year we are looking for 25 organisations to take part in this fundraising challenge! 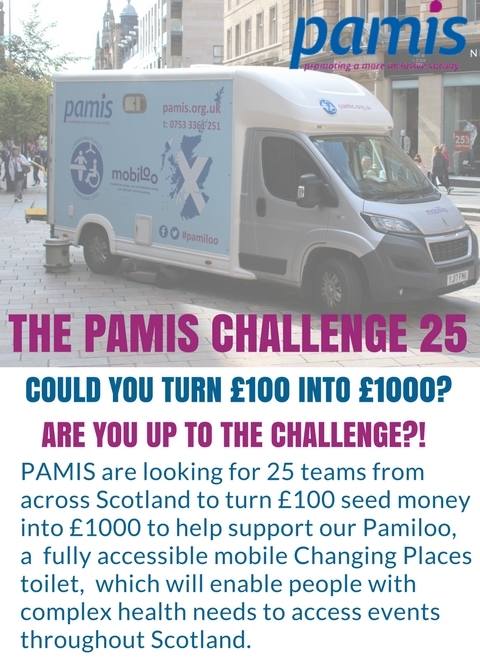 The PAMIS Challenge 25 is fundraising challenge to support the new Pamiloo – a fully accessible mobile Changing Places vehicle. Hundreds of families in Scotland are unable to attend events such as festivals, visitor attractions, exhibitions and sports fixtures due to a lack of suitable facilities. The alternative to staying away is often to change loved ones on the floor of a public toilet. People with profound and multiple learning disabilities, and others with complex health needs including spinal and brain injuries, multiple sclerosis, cerebral palsy, parkinson disease, often require a Changing Places toilet which includes and adult changing bench, a hoist and tracking system and room for two carers and a wheelchair. With the purchase of this mobile Changing Places vehicle PAMIS are now opening up events across the country to families and supporting them to access the same days out that everyone else enjoys. We have been fundraising for this vehicle and have raised over £22,000 of the £45,000 purchase costs but we also need to support the running costs which include insurance, diesel, maintenance and consumables. We would be delighted if you would support this wonderful vehicle. Inspired by our 25th anniversary we are looking for 25 organisations to take £100 seed money and turn it into £1000 in any way that you wish. You can be as creative as you like with your fundraising. 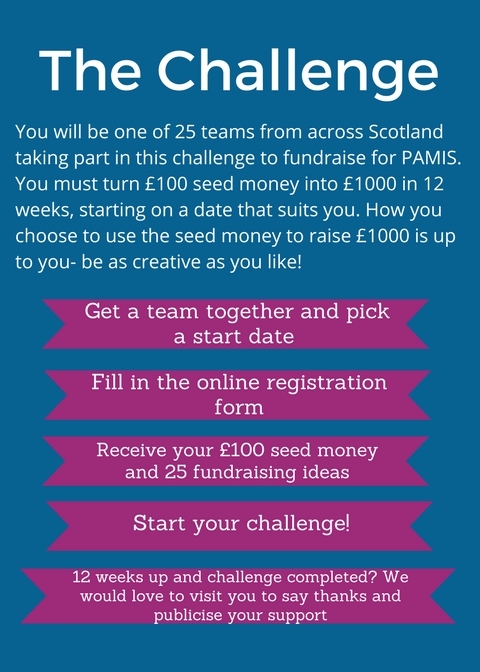 Once you sign up we will send you 25 fundraising ideas, sponsor forms (should you wish to use them) and your £100 seed money. We will also support you through out the 12 weeks of your challenge and you can start on a date that suits you. 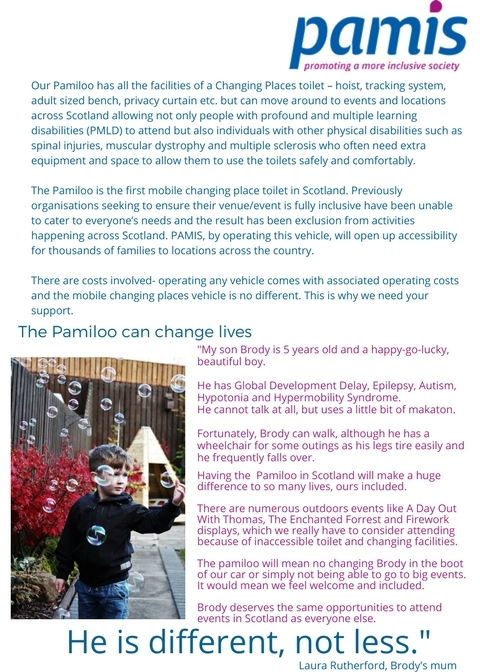 There is more information about the challenge, the pamiloo and how it will change lives below.